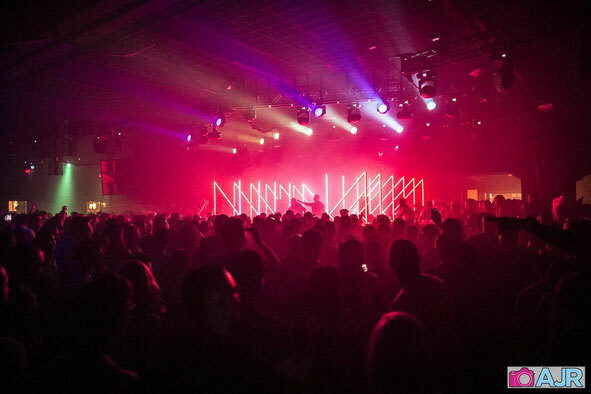 Last Saturday, Deep Dish (aka DJs Dubfire and Sharam) made their much anticipated headline return at Miami’s Ice Palace Studios, bringing along friends Andhim, Hot Since 82 and Carl Craig for a night (and morning) to remember. Introduced by Pete Tong, and with some of dance music’s biggest names in attendance, Deep Dish took to the stage under the cloak of darkness with their mysterious ambient intro signalling their return. Several minutes of build kicked into a 4/4 beat that revealed a massive stage spanning LED wall with three-dimensional arrows caging Deep Dish. Through the next six hours Deep Dish went on a techno and house music journey through the past, present and future. In addition to dropping their own ‘The Future Of The Future (Stay Gold)’, ‘Dreams’, ‘Flashdance’ and current track, ‘Quincy’. They also showcased solo productions including Dubfire’s ‘Exit’ (feat. Miss Kittin) and Sharam’s ‘Tripi’ (feat. Manfred Mann's Earth Band) along with tracks from the SCI +TECH and Yoshitoshi labels. This is first phase in what should be a huge summer for Deep Dish. Catch them next at Bal en Blanc in Montreal on 20 April, Hakkasan in Las Vegas on 1 June and Digital Dreams in Toronto on 28 June, with more dates will be announced soon.